SPECIALIZED IP COURTS ABOUT TO LAUNCH IN THREE CITIES – AND ARE THEY GOOD FOR FOREIGNERS? Recent Chinese efforts at developing specialized IP courts and in promoting greater judicial independence suggest that the system may significantly improve in the years ahead. According to press reports, some of these efforts may take final form at the 10th meeting of the 27th Session of the Chairman’s Council of the 12 Session of NPC Standing Committee which will be held on August 25 through 30. At that meeting, the NPC Standing Committee will review the bill submitted by the Supreme People’s Court which is the Draft Resolution of SPC to Establish IPR Courts in Beijing, Shanghai and Guangzhou. China has had specialized IP tribunals (ting 庭), beginning with an initial experiment in 1993 in Beijing. Currently there are about 3,000 judges in sit these tribunals. In addition, there are 560 tribunals throughout the country, including basic, level, intermediate, high court and supreme people’s court tribunals or divisions. In recent years, China has been experimenting with more basic courts (e.g. Yi Wu People’s Court and Kun Shan People’s Court) hearing IP cases including patent cases. Historically, these tribunals had sometimes been called “No. 3 Civil Tribunals” (e.g. No.3 Civil Tribunal of Shanghai Higher People’s Court, No.3 Civil Tribunal of Pudong District People’s Court), “No. 5 Civil Tribunals” (No.5 Civil Tribunal of Shanghai No.1 Intermediate People’s Court, No.5 Civil Tribunal of Shanghai No.2 Intermediate People’s Court) or IP Tribunals (IP Tribunal of Zhuhai People’s Court). Increasingly these tribunals may combine civil IP jurisdiction with administrative review and criminal jurisdiction (“three in one tribunals”). As civil enforcement is the lion’s share of judicial IP litigation, the civil experience of these judges has in a sense helped also to develop the capacity of China’s judiciary to handle criminal and administrative litigation. In addition, by combining civil, criminal and administrative jurisdiction there is a greater likelihood of consistent handling of matters that may cross jurisdictional boundaries such as use of administrative evidence in civil cases, providing civil compensation in criminal matters, referring administrative or civil matters to criminal litigation, or handling patent and trademark validity matters in conjunction with an ongoing civil case. Today all of these matters may be handled in one tribunal. What prior work has been done in this area by the Chinese government? While specialized IPR courts have been talked about for some time, institutional improvements in the IPR tribunals were set forth as a national goal in the Outline of the National IP Strategy (2008) which was coordinated by SIPO. The NIPS stated “Studies need to be carried out on establishing special tribunals to handle civil, administrative or criminal cases involving intellectual property”. The SPC took an important step in this direction in July 2009, when it directed the civil IP tribunals in the Beijing No. 1 Intermediate Court to handle validity matters on appeal from China’s patent and trademark offices. (最高人民法院关于专利、商标等授权确权类知识产权行政案件审理分类的规定). The impetus to develop specialized IP courts in China took an even greater leap forward back on November 12, 2013, at the Third Plenum Session of Eleventh Communist Party Central Committee (the “Third Plenum”). The Third Plenum set as a goal to “explore the establishment of intellectual property court(s).” Since that time, Beijing, Shanghai, Guangzhou, Nanjing, Chengdu, Zhengzhou had started to apply for establishing the IP court with the Supreme Court. On March 10, 2014, Zhou Qiang(周强), the President of the SPC discussed the work schedule of 2014 and said that the Supreme Court would promote to establish the specialized IP court. On July 9, 2014, the Supreme Court at its press conference outlining judicial reforms for the Supreme Court (2014-2018) discussed establishing Specialized IP courts at places where IP cases are concentrated. Professor Tao Xinliang (陶鑫良) had proposed establishing the IP Intermediate Court at some places where IP cases concentrated to judge the civil IP cases and administrative IP cases of the first instance and the civil IP cases, administrative IP cases of the second instance and some criminal IP cases. (Prof. Tao Xinliang 陶鑫良<Some thoughts on Establishment of Specialized IP Court建立知识产权法院的若干思考> Madame Tao Kaiyuan (陶凯元) , a Vice President of the Supreme Court, and a former Director General of the Guangdong IP Bureau (where she likely worked with Vice Premier Wang Yang（汪洋）) has also said that the SPC should continue to promote three-in-one IP tribunals. Why might China be adding a new emphasis on a specialized IP court in additional to combined tribunals? A specialized IP court may promote and improve the civil judicial enforcement system by providing more resources, promote the independence of the judiciary, and provide for more training of judges, particularly on technical patent matters. The judges of a specialized IP court might be even more professional and autonomous. They might be better able to handle the administrative cases, criminal cases and civil cases at the same time. Like other specialized courts (e.g maritime, military, railway court), civil/criminal and administrative jurisdiction would also combined, reflecting the subject matter expertise of the judges in that court and likely reducing subject matter and venue conflicts for IP litigation. The SPC has not yet published the detailed program for implementation of specialized IP courts. In addition, we have heard little about important areas of the IP tribunals’ jurisdiction which are not as directly related to IP, such as antimonopoly law, unfair competition and licensing, and whether these areas will also remain within the specialized court jurisdiction. We assume they will be, and would actually hope that other IP-related areas could be specifically included (such as consumer protection, substandard products, and geographical indications). However, we have seen nothing to date discussing these areas. Will a specialized IPR court be good for foreigners? Most foreign rights holders have continuing concern with local protectionism and political influence in IP adjudication. Beijing, which appears to be a focus for development of a specialized IP court is the jurisdiction that appears to hear the most foreign cases. As we have previously blogged, foreign parties are involved in approximately 47% of their administrative appeal docket (which is primarily based in Beijing); or about 1349 cases, nearly equal to the number of infringement cases in 2013 of 1429. Hopefully, giving the Beijing courts more independence and confirming their “three in one” approach will provide greater judicial autonomy for the Beijing courts. One concern is whether specialized IP courts will indeed function in a more independent manner than IP tribunals. The US experience with our specialized national patent court, the Court of Appeals for the Federal Circuit, has generally been that the CAFC has some impact on correcting local biases at the trial court level, including possible anti-foreign jury bias. This is borne out by data which shows that in general, reversal rates in favor of foreigners is higher at the CAFC than reversal rates in favor of domestic entities. Source：Paul M. Janicke & LiLan Ren, Who Wins Patent Infringement Cases?, 34 AIPLA Q.J. 1 (2006). However, according to data from the CIELA database (www.ciela.cn), second instance patent appeals in China generally show an inclination to support the Chinese domestic party against the foreigner. Why might appellate IP courts or tribunals behave differently in each country? First, the CAFC is a national court, not a regional or local court. In this sense, it may be more accountable to national law and reputation than local courts. The CAFC under former Chief Judge Rader had in fact been a leading global proponent of national specialized IP courts. Second, the CAFC has a different jurisdictional role. It does not retry cases, rather it hears appeals. In addition, it hears both patent validity and infringement matters in one court. Moreover, its decisions on matters of law are binding on lower courts. As such, it has more authority in deciding legal matters, and in instructing lower courts on proper adjudication. For example, the CAFC had taken an active role in addressing venue issues at the E.D Texas on patent litigation issues. A third reason is found in China’s political situation. In general, Chinese courts are much less independent than US courts. Local Chinese courts, particularly in remote areas, may also tend to be even less accountable to national law and policy. Second instance Chinese courts may be more susceptible to receiving national policy directives and may therefore be more susceptible to national political influence in adjudicating disputes. Moreover, local statutes enacted by local people congress are at a higher political hierarchy than national administrative rules (部门规章). The local political congresses that enact these statutes also appoint judges. When a second instance case is heard, for example, in a provincial high court, there may in fact be a problem of more direct political influence through political actors in the provincial capital. The limited data available to date suggests to me that while specialized IP courts have promise, their potential impact will also be affected by national judicial reform efforts and may continue to be constrained by existing limitations in the political independence of the Chinese judicial structure. As Susan Finder has noted in her blog, there are several efforts under way to address some of these systemic issues in the Chinese judicial system, which may also bear promise for Chinese IP adjudication. In sum, specialized IP courts may not be the panacea that foreigners might otherwise seek in minimizing anti-foreign bias in local adjudication in China, but I do believe they offer some hope for a better and stronger judiciary. By Mark Cohen, with Ms. Yao Yao of Fordham Law School (LLM Candidate, 2015). On July 16, the Supreme Peoples Court published a public comment draft of proposed revisions to its “Decision of the SPC Regarding Questions of Application of Law in Adjudication of Patent Cases”, 最高人民法院关于审理专利纠纷案件适用法律问题的若干规定. Comments are due by August 15, 2014. Comments may be emailed to: zhuanliyijian@163.com。 The last revision to this document was in 2013, when a provision was inserted to give jurisdiction to designated basic courts to handle patent cases. Of particular note in this short set of revisions are provisions regarding providing an appraisal report for utility model patents to the court if such a report had been requested by the plaintiff of SIPO, as well as provisions which appear to provide more flexibility in calculation of damages by the court, consistent with the 2008 patent law. Many of the changes appear self-explanatory – such as those which track changes in relevant statutory provisions. However, in light of the efforts to amend the patent law, experiments in specialized IP courts, calls for more deterrent damages and more extensive commercialization of IP rights, some additional explanation would be helpful regarding the reasons for any changes in policy that may be implicit in these revisions and any further changes that may be contemplated. Earlier USG comments on the patent law revisions are found here. Once I receive a full translation or comparison of prior drafts from any reader, I will post it on line. Readers are encouraged to send in their translations, suggestions and comments. For now, the full Chinese text of the proposed revisions with my own initial bilingual observations are attached. What are the impacts of the resolution and spirits of the recent Third Plenum of the 18th Communist Party on rule of law in China, particularly commercial rule of law and IP? 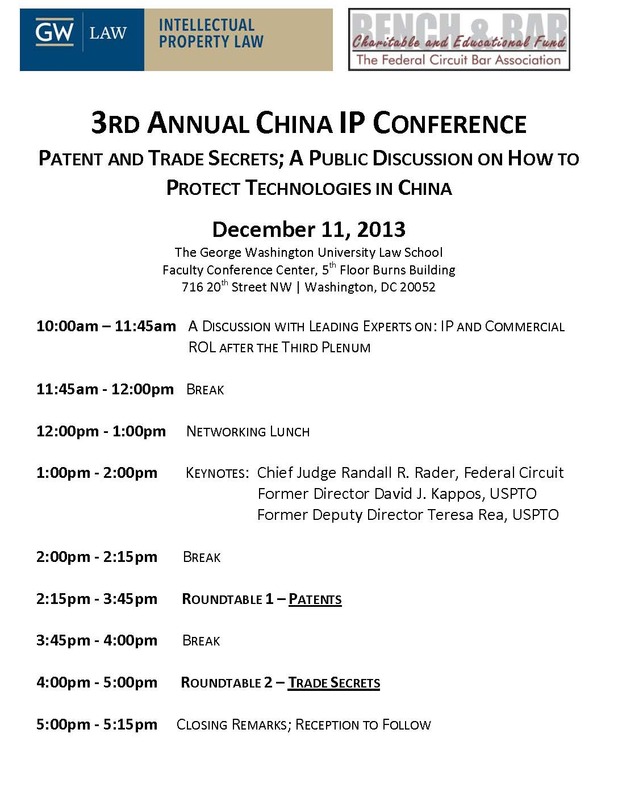 The morning of December 11, from 10:00 to 11:30, George Washington University Law School will be hosting its third annual China IP Program to discuss what China’s recent rule of law developments mean. I will attend this program along with Don Clarke of GWU, Xuan-Thao Nguyen (Southern Methodist University), Chief Judge Rader of the CAFC and others. By my reckoning there have been three important streams of change affecting IP and rule of law in the past few months. One of the important developments is administrative transparency and accountability. As previously reported, Premier Li Keqiang is seeking to establish greater transparency in administrative enforcement decisions, through the State Council’s enactment of an “Opinion on Making Publicly Available According to Law Information on Administrative Penalties Concerning the Production and Sale of Fake, Counterfeit and Sub-standard Goods and Intellectual Property Rights Infringement” (关于依法公开制售假冒伪劣商品和侵犯知识产权行政处罚案件信息的意见). At a conference this past December 5 sponsored by MofCOM, we were told that this regulation is likely to be made public available in the near future. Moreover, as many as 300,000 cases each year involving IP infringements and fake and shoddy goods are likely to be affected. Another important area is in general judicial transparency and reform. SPC President Zhou Qiang discussed the importance of publishing court decisions involving intellectual property in an important exchange he had with Chief Judge Rader on October 16 of this year. Since that time, according to press reports, the newly appointed SPC President has vowed to increase transparency in the judicial process in light of the spirit of the recently concluded Third Plenum. Another important judicial reform that could be significant for IP in the CCP Resolution involves “explor[ing] the establishment of judicial jurisdiction systems that are suitably separated from administrative areas, guarantee the uniform and correct implementation of State laws” and to “reform the trial committee system, perfect case handling responsibility systems for presiding judges and collegiate benches, let those hearing the case judge, and those judging the case be responsible.” The former, if fully implemented, would support greater independence of the courts from the local governments that fund them, and the latter would dilute influence from adjudication committees and return decision-making power to judges who hear cases. As it is possible that a disproportionate number of foreign-related cases are decided by adjudication committees, this could be a significant development. Compared to the National IP Strategy, the CCP Resolution is a higher political statement. Moreover, its substance is not limited to appellate courts, nor constrained to “technologically complex cases”. While in 2008 an appellate IP court had been considered necessary to provide protection from local influence, the CCP Resolution notes elsewhere and more generally that China should establish “judicial jurisdiction systems that are suitably separated from administrative areas”. One conclusion: the necessity of having courts that are less tied to local influence has migrated from an IP-related topic in the 2008 National IP Strategy, to one involving general legal reform. Several courts are already moving to establish specialized IP courts. At a recent program I attended in Suzhou sponsored by Renmin University, the President of Jiangsu’s High Court noted that Jiangsu is actively preparing for establishing such a court. Moreover, the media has noted that Guangdong is also conducting research efforts for its establishment. Both jurisdictions are pioneers in combining civil/criminal and administrative IP jurisdiction in one tribunal. Beijing was the first jurisdiction to establish IP tribunals in its intermediate courts (1993), and is probably the most important place where greater improvements could assist both foreign and domestic rights holders, as it is the jurisdiction where appeals from the patent and trademark offices are held. As I have noted in a prior blog, foreign parties are involved in approximately 47% of that IP administrative appeal docket. Former Supreme People’s Court IPR Tribunal Chief Judge Jiang Zhipei has also been a strong advocate for specialized IP courts in Beijing because of its national and international influence. I share the hope of my friend Chief Judge Jiang that the CCP Resolution will help accelerate the establishment of these specialized IP courts and even more importantly, improve the adjudication of all legal issues matters for Chinese and foreigners alike. Published information should include the principle facts of the determination of illegality, the type of penalty, the basis for the decision and the results. This should be open and transparent, and there should be prompt replies to social concerns. Further, relevant administrative penalty information should be included in the social credit system so as to create “omnipresent constraints” on the creditworthiness of counterfeiters and infringers. Here it is in Chinese: http://www.gov.cn/ldhd/2013-11/20/content_2531230.htm. The transparency contemplated by Premier Li may yet prove challenging to achieve for administrative IP and IP-related actions. The number of IP administrative cases (patents, trademarks and copyrights) is in excess of 100,000 at this time. 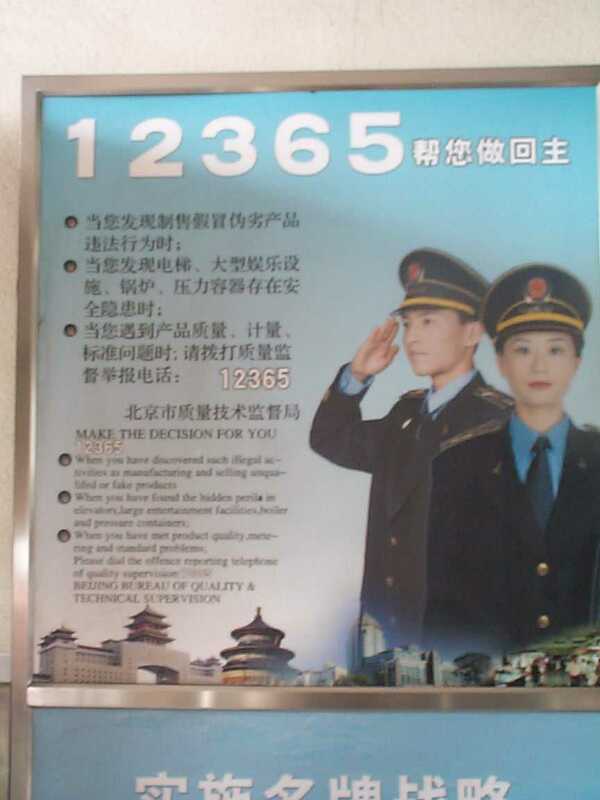 If one included “substandard” goods, and other quasi-IP enforcement, for the full range of Chinese enforcement actors, the numbers could easily exceed 200,000 – including the enforcement regimes of SAIC (trademark, but also consumer protection, and antitrust), AQSIQ, SFDA, Ministry of Culture, SARFT/GAPP, Tobacco Monopoly, Chinese Customs, City Management (Chengguan), Police, etc. One also hopes that these transparency efforts can also improve the administration of antitrust cases involving IP, where both general data as well as case-specific information is often lacking. It is also hoped that non-confidential versions of cases involving confidential information can be made available, even if there is confidential information in a specific case. It is remarkable to think how far the quest for administrative transparency in IP has progressed since China joined the WTO. The TRIPS Agreement, Article 41 provides: “Decisions on the merits of a case shall preferably be in writing and reasoned. They shall be made available at least to the parties to the proceeding without undue delay.” Back in 2004, at the Trade Review Mechanism of the WTO, the Chinese delegation was asked to provide copies of its enforcement decisions. The response was: “Regarding obligations of administrative agencies to provide written decisions with interpretations for their enforcement decisions, [the Chinese delegate] said that his delegation believed that this question was not relevant to the IPR system and that his delegation was not obliged to answer it here.” TRIPS Council Meeting of December 1-2, 2004, IP/C/M/46 (11 Jan. 2005). The statement was repeated in a similar fashion later in 2005: (TRM, IP/C/39, p. 4 (21 Nov. 2005). The US requested a summary of China’s enforcement cases in its so-called “Article 63” request, which included information of the type that Premier Li is now requesting – information on the legal basis, remedies, location, year, competent authority, type of product, transfers to criminal authorities, and whether foreign nationals were involved, which was never provided (IP/C/W/461, Nov. 14, 2005). Along with the legal reforms of the Third Plenum and other changes from the Supreme People’s Court under Zhou Qiang, these are signals suggesting deeper roots for China’s legal reforms, particularly in China’s omnipresent administrative system.